Made With Mu | A blog to celebrate projects that use the Mu Python code editor to create cool stuff. Thanks to Ben Nuttall, one of the maintainers of the wonderful, GPIOZero library, love is in the air. Why not serenade your Valentine with Mu, a distance sensor, speaker, Raspberry Pi and some nifty Python code which uses GPIOZero to turn the hardware into a romantic Theramin..? For those of you who don’t know, CircuitPython is Adafruit’s “flavour” of the amazing feat of engineering that is MicroPython. MicroPython is a complete reimplementation of Python 3 for microcontrollers and embedded devices. MicroPython has all the features of regular Python (sans standard library) and can run in as little as 8k of RAM. 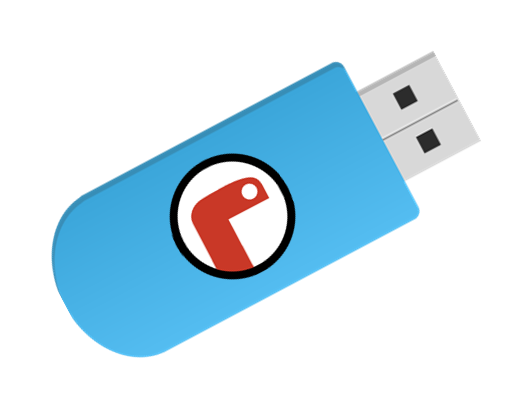 CircuitPython builds on MicroPython’s rock-solid foundation with education/beginner friendly libraries and APIs. They provide a consistent way to interact with Adafruit’s amazing line of boards for learning about and hacking around with electronics. The following video (featuring Adafruit’s founder, Limor “ladyada” Fried, and friends) sums up their aims pretty well. Mu has an Adafruit mode which makes it very easy to program Adafruit devices running CircuitPython. This is how Mu and CircuitPython are related in a technical sense, above and beyond the complementary educational aims of both projects. It would be really helpful if there were a friendly CircuitPython landing page to which we can point folks and from which visitors can easily find the chat, tutorials, list of supported boards, source code, technical docs and other good stuff. Continue to inspire a community of learners (no matter how long we’ve been programming, we’re all still learners, right?). The second point needs more explanation. 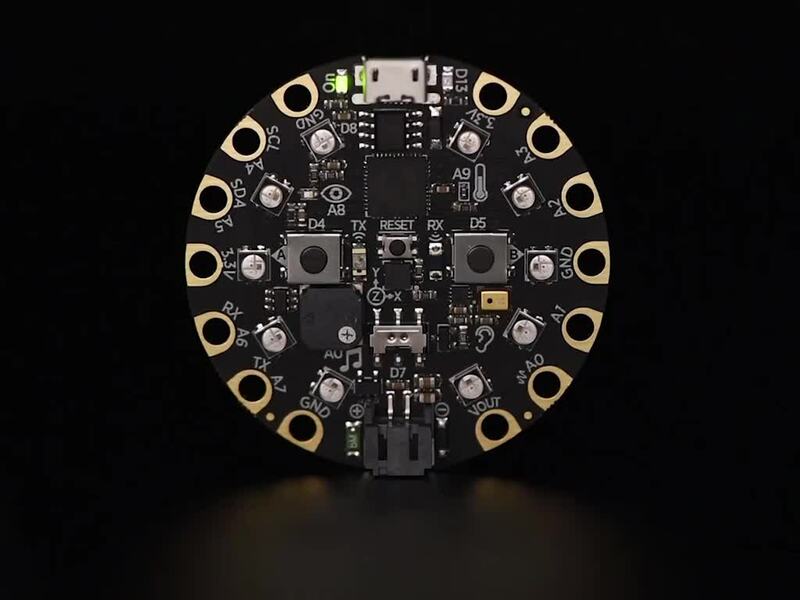 The CircuitPython folks at Adafruit take great care and attention over how they facilitate the community growing around the project. The result of their efforts is a welcoming, diverse and supportive group of people championing CircuitPython through their projects, code and interactions with the wider “tech” community. CircuitPython is one of the best examples of this sort of community organising that I know of. At a time when technology is finding its way into every aspect of our lives it is important that everyone has access to the tools and knowledge needed to learn how to take control of their digital world. Rather than being tech “consumers” I hope folks become tech “makers” armed with the skills needed to make the digital world reflect their own desires and needs. Sadly, the tech world has a history of being open only to certain types of people (mainly people like me: white straight dudes with the privilege of money to buy equipment and time to attend to their education). It means technology usually only reflects the desires and needs of just these sorts of people. We can do better than this skewed state of affairs. In a very practical sense Adafruit’s CircuitPython is an antidote to the exclusion of folks in tech. They are fostering an open and inclusive community around an easy-to-learn and affordable project that helps folks learn about technology. Such community building is incredibly hard to pull off and sustain. So my wish is that Scott, Kattni, Dan, Phil, Limor and all the others working so hard in this respect with CircuitPython find the energy, support and compassion needed to continue to inspire the community growing around their amazing project. Best wishes from your friends working on Mu! The next version of Mu will be 1.1. This post describes how we’re going to get there and what to expect on the way. The first thing you should know is that 1.1 will have new features including new modes, new capabilities and new ways to configure Mu. Some of the new modes have been kindly written by new contributors. The new capabilities and ways to configure Mu are based upon valuable feedback from folks in the community. Thank you to everyone who has contributed so far. The second thing you should know is that 1.1 will have many bug fixes. Since Mu 1.0 was released a huge number of people have started to use it and, inevitably, found and reported bugs. Thank you for all the valuable feedback, please keep it coming! We hope to address as many of the problems as possible. The final thing you should know about is the release schedule for Mu 1.1. Very soon, a version 1.1.0.alpha.1 will be released: this will contain some of the new features and updates and will definitely contain bugs. It will be followed with a number of further alpha releases as new features are created and/or contributed to this version of Mu. When we’re happy we have all the features we want, we’ll release a version 1.1.0.beta.1. The focus of the various beta releases will be to test and fix any bugs we may encounter. However, the beta releases will be “feature complete” and represent a good preview of what version 1.1 will look like. Once there are no more known bugs, or those bugs that remain are “edge cases” that can be documented, we’ll release the final 1.1.0 version which will be available for official download. The old 1.0. * version of Mu will still be on the website, but no longer officially supported. Such work will touch all aspects of the Mu project: the editor, the associated projects for generating resources for the editor, the documentation and the website too. It will also mean the translations will need to be checked and updated to deal with any UI changes. 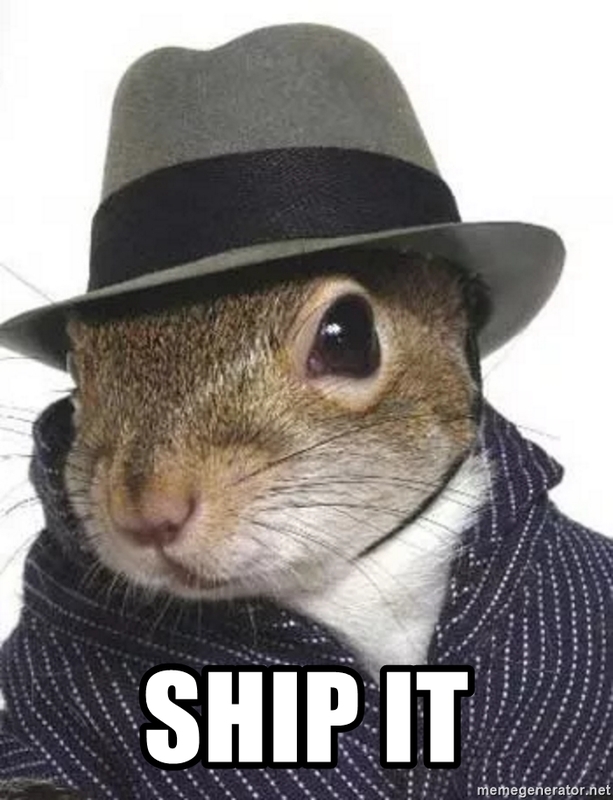 Some of you may be contributors waiting for us to merge your work or respond to your suggestions. We promise we will always be respectful and supportive of your efforts. However, we may not accept all contributions. This reminds me of my work as a musician: when auditioning players for a band or orchestra you meet a huge number of talented musicians, but there may only be the need for one flute player. Any number of the musicians who auditioned could have easily played the flute part, but the person who was offered the job was the one who it was felt fitted in with the rest of the orchestra. Likewise, if we don’t merge your contribution, it’s likely that it’s because it either doesn’t quite fit with our vision for Mu, or the capabilities it provides are met in some other preferred way. We will, of course, explain our decisions via discussion on the relevant pull requests. Nevertheless, please don’t be disheartened if we decline your contribution – it’s certainly not a criticism of your efforts (which we value hugely). This is a LOT of work, and we ask you to be patient as we volunteer our time to make the next version of Mu. However, we’re a free software project developed in the open and so we would love to hear your input as work progresses. Wouldn’t it be cool to be able to say, “you see that feature? I suggested that”. Together, we can collaborate to make Mu a better editor for beginner programmers and those who support them. Mu is not a solo effort. Many folks have contributed to Mu, and I will be eternally grateful for their work. With the spirit of recognising the voluntary contributions of others in mind, I’m going to write about some of our most prodigious programmers. First up is Zander Brown. Zander, like Top Gear’s the Stig, is a bit of a mystery. Until recently, nobody had ever met him in real life, and all interactions with Zander were via copious GitHub comments, pull requests and bug fixes. Some said he was an alien being from another dimension, others claimed him to be a rogue artificial intellegince running rampant in random Git repositories, yet more people whispered in hushed tones that he was merely a pseudonym for Bill Gates, coming out of retirement to contribute to free software projects. All I can say is that I’m thankful for his considerable contributions to Mu’s code base, eagle-eyed code reviews and seemingly limitless Pythonic knowledge. We have a courteous, knowledgable and extraordinarily competent contributor to Mu. Zander’s participation is evidence that the Mu project is welcoming, safe and supportive enough to encourage the participation of teenage coders. Zander, a student who uses Mu, is helping to develop Mu. I would very much like to foster this sense of ownership in Mu’s users, be they students, teachers or professional software developers. I recently asked Zander how he got into Mu. 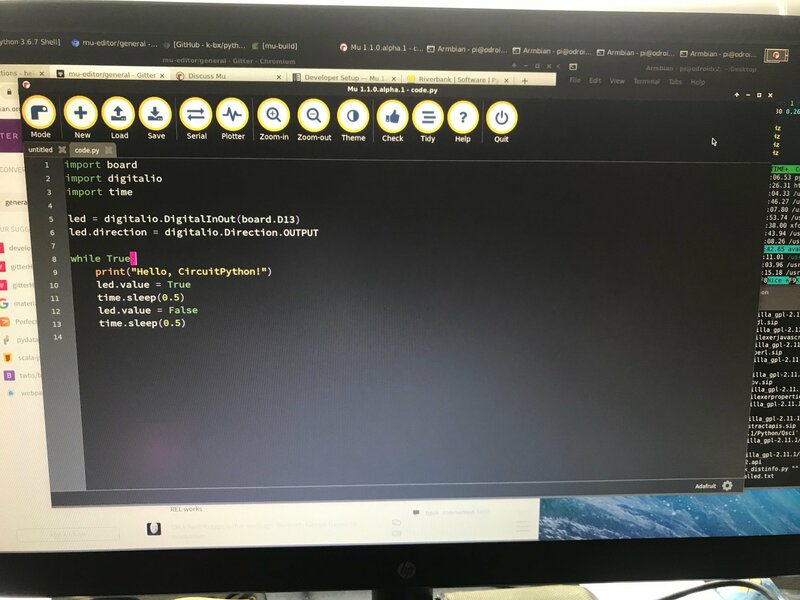 His reply was interesting in that he typed “micro:bit Python” into a search engine after his school had some of the early versions of the device delivered to teachers. 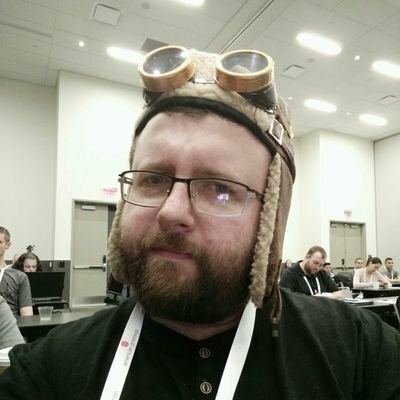 Recently I’ve been contributing the GNOME which has the ‘coolness’ that you are in country A working with person in country B to make something that’ll be used in A, B, C & D but also being a tad ‘meta’ when you’re fixing a bug older than you. How does he find working on Mu? Zander, thank you for your continued contributions and best of luck with your studies (he wants to go on to study Computer Science at university). I have no doubt that wherever you end up studying will soon learn how fortunate they are to have such a talented student as you. This wasn’t my first visit to see Steve. He very kindly allowed me to observe his lessons back in 2017 when I was researching how learners and teachers engage with software development tools. 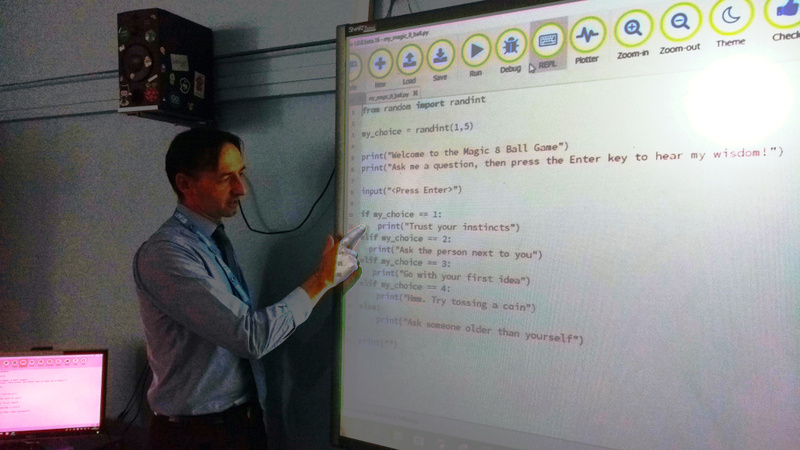 His was the first of several schools and code clubs I visited for this purpose and, in addition to observing lessons, I interviewed him and some of his colleagues. In fact, it was as a direct result of chatting with the network administrators at Steve’s school that so much effort was put into making Mu easy to install. I was very pleased to hear that the very same network administrators had easily managed to install Mu on the computers in Steve’s classroom. 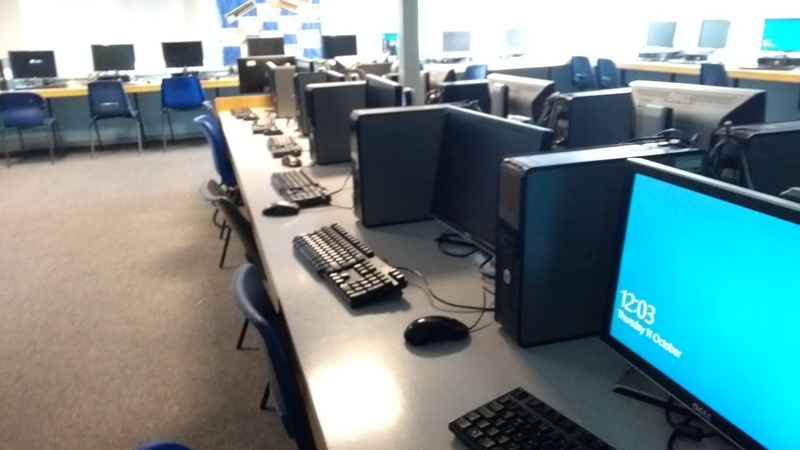 On this visit I observed two lessons: a year 10 GCSE class (students turn 15 during year 10, and GCSE is the examination all students take at age 16), and a year 9 computing lesson (students turn 14 in year 9 and decide their “options” [which GCSE courses to take] during this academic year). Both classes were exceptionally well behaved and engaged and the students were friendly and enthusiastic to learn. They’re a credit to themselves, Steve and their school. I was simply introduced to the students as “Nicholas - a software developer” and played the role of a teaching assistant. This prompted a sense of nostalgia for me. Having students say, “Sir, I’m stuck on this problem” made me remember my time as a secondary head of music all those years ago and it was fun to collaborate with and support young people in their learning. There are some aspects of teaching which are extraordinarily rewarding and a privilege to experience – this was one such an occasion. The students in year 10 knew what they were up to and were already familiar with Mu. It was good to see them use the editor with such fluency ~ to the extent that they were concentrating on their coding problem rather than getting side-tracked by their development environment. The first time I visited the school, I seem to remember students using some sort of online Python tool and I spent much of my time trying to help them fix the odd state into which they had got themselves. I also had a great sense of satisfaction when I saw how many of them were using the “Check” button to report potential problems with their code. They told me they found this especially useful when they ran their code and ended up with a syntax error. The “Check” button visually points out the problematic line and describes the problem. Far better than wading through terse computer-ese. The year 9 class was especially enjoyable since I was watching their first encounter with Mu. In the previous academic year (before Mu 1.0 was released) they had been using IDLE as a development environment. Being able to observe their first contact with Mu was an amazing opportunity. Steve started the lesson by introducing Mu as a new Python editor and then gave the class a few minutes to poke around with it before asking them to report back on what they’d discovered. Within seconds, one of them had found the “Theme” button and toggled through to “night” mode. 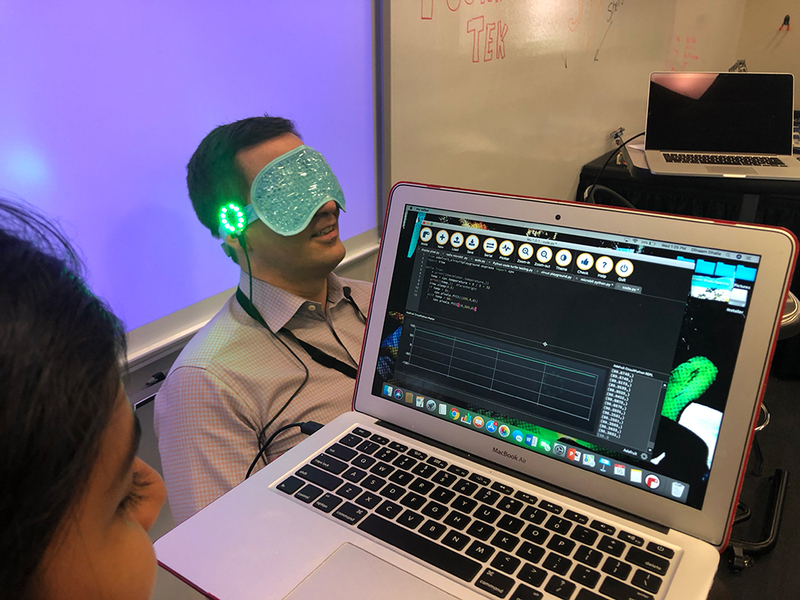 This was followed by a hilarious few seconds of excited whispering as the students all tried to turn their Mu editor into “night” mode. Within about a minute, everyone had “night” mode enabled and the class were feeling suitably “Hollywood hacker-ish”. Some kids found the “Check” button while others enjoyed zooming in and out to extreme magnifications of their code. Most importantly, the feedback seemed positive and the students enjoyed playing with Mu (yes, “playing” is perhaps the right word). Steve then asked them to “code along” a Magic 8 Ball script. Steve would explain some code and demonstrate it working, then ask the kids to type it in and check their version was working. After that, he’d repeatedly add more features, while giving the students an opportunity to ask questions, until the program was finished. This is exactly what Steve is doing in the photograph at the top of this blog post. This activity was particularly fun since the students could define their own mysterious sounding Yes/No answers for the “magic 8 ball”. In a very teenager-y turn of events, one student cast their answers totally in the context of resolving relationship problems. Again, Mu didn’t cause any issues and the students could simply concentrate on customising their script. At the end of both lessons I was given 10 minutes to tell the students a little bit about what I do as a software developer and enjoyed answering their questions. When Steve revealed I was the creator and maintainer of Mu, the year 9 class gave me a round of applause (after one girl started clapping loudly on her own, and then shouted to the rest of the class something along the lines of, “Give this guy some respect won’t ya..?”). After the lessons Steve and I spent some time together in an interview / de-brief session. He provided more context about how Mu was used in his lessons and all the feedback I have received, be it from teacher or students, will find its way into improvements in the next version of Mu. If you are a teacher using Mu in your classroom, please don’t hesitate to get in touch. We’d love to hear how you’re getting on and learn about the ways we can improve your own and your students’ experience of learning to program in Python. At this point in the development of the game, one of us had the idea of adding zombies and, since I’d been tweeting about our progress, we were getting suggestions for other features from friends (such as potholes in the road which would slow you down, or drivers with no lane discipline). 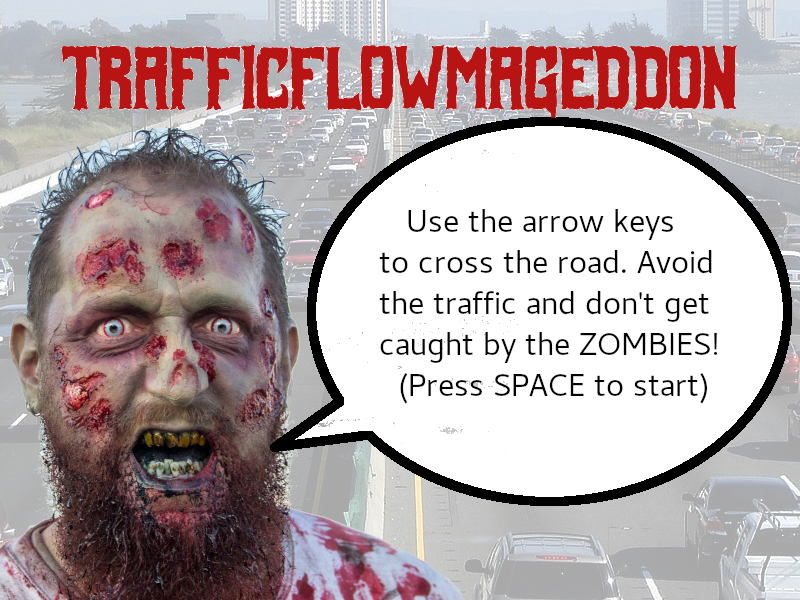 The zombies make a big difference since they force you off the pavement and into the flow of traffic. In the meantime, Andrew had been putting together music and sound effects as well as the code to load and play them at the appropriate moments in the game. This was especially rewarding to hear since sound and music add so much to the atmosphere. Andrew found some appropriately spooky sounding music, a “happy tune” to play when the game completed and a whole host of sounds for the zombies and traffic (for example, if you get too close to one of the London taxi cabs, the driver will shout at you). As the video shows, the finished game works quite well for something cobbled together in just a week. Most importantly, it’s all done with Mu and PyGameZero in around 400 lines of Python. I’d heartily recommend anyone participate in future PyWeeks. The organiser, Dan Pope (who also created PyGameZero) has done a fantastic job of creating such a fun competition with a community of coders creating such joyously goofy games. 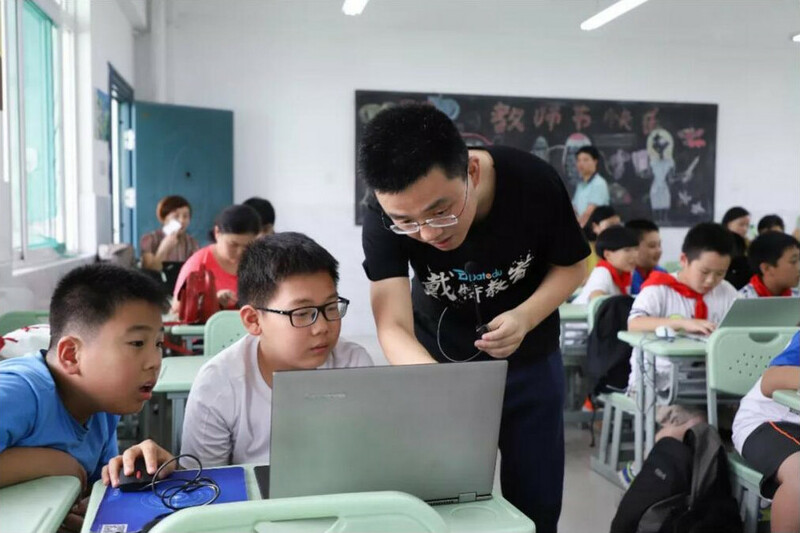 Thanks to the efforts of volunteer teachers, young Chinese students are using Mu to learn Python. He goes on to explain how learning to code is making a big impression of some of his students and their families. “The little boy in the [following] photo inspired me, he is very clever and he can answer almost every problem in class. 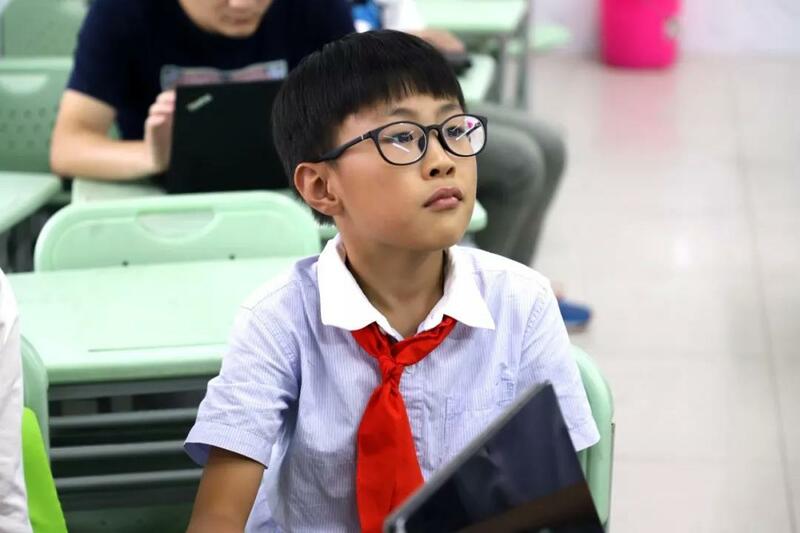 This boy father is so seriously to this class, he find a app which can coding in iphone, and he learn it himself to teach his son after school. I have to admit that I was deeply moved by this explanation. 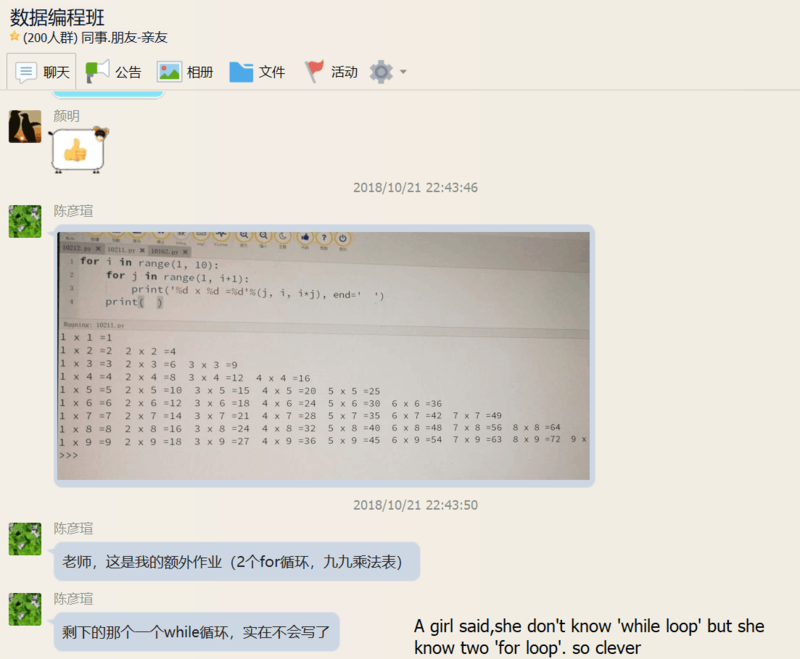 I was also amazed to see that the teachers and students use a sort of chat app for sharing and marking homework. It makes me extraordinarily happy to know that our collective efforts in translating Mu for learners who don’t have English as a first language are paying off. 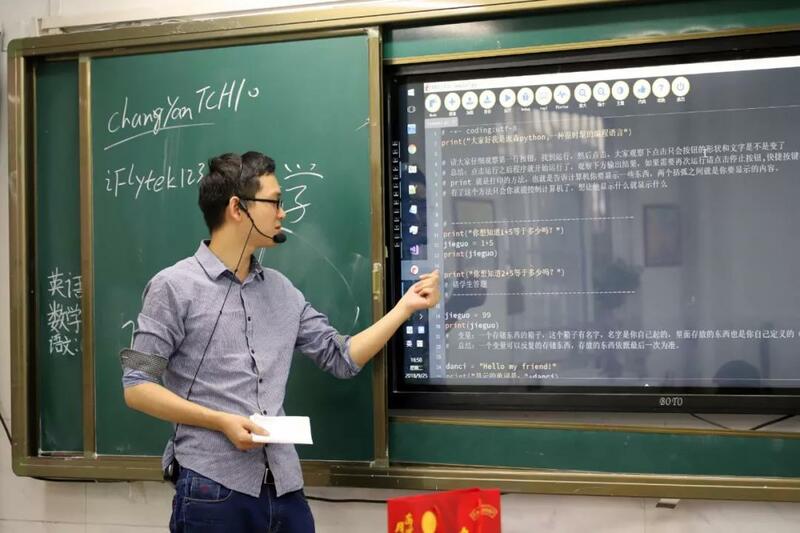 I’d like to applaud the efforts of the volunteer teachers in China who are helping to nurture the next generation of Python programmers. Finally, I would like to wish their students (and parents!) the very best of luck when learning to use Python. You are learning a skill that will help you flourish in our modern technological world. Please keep up your efforts and, if you have time, keep sharing what you have been doing. Perhaps, in the future, you will speak at PyCon China. I’m struck by how similar programming is to another passion of mine: music. Both are cross cultural and international endeavours. By sharing our code, learning from each other and telling stories of programming we bring our world closer together. I’m so pleased you think so! Thank you! 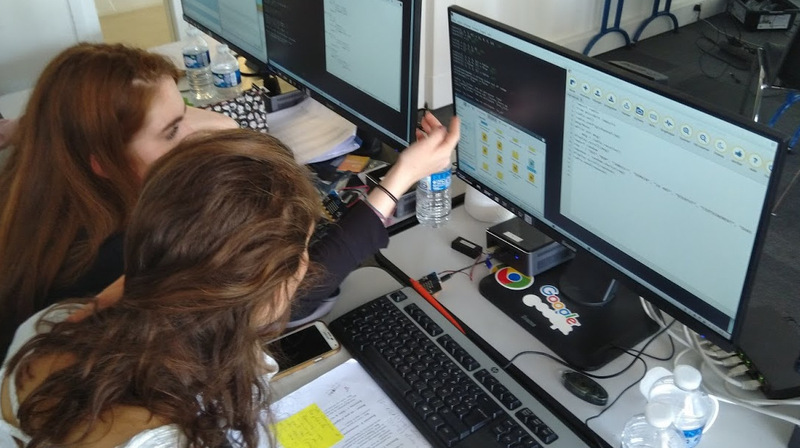 This second guest post, from Thierry Chantier, describes how the French Python community is helping young programmers with Mu. I’m especially pleased that he’s submitted his blog in French. We love to celebrate the efforts of Mu users all over the world! Tout d’abord, je me présente : Thierry, aka titimoby sur Internet depuis déjà quelques années. Même si je suis également passionné de musique en fréquences basses, je suis pour ma part tombé dans la marmite informatique dès le plus jeune âge. D’ailleurs, mon premier rêve de geek fut l’achat d’un ZX Spectrum+, cette merveille elle aussi issue des terres anglaises. Toujours est il qu’après un parcours dont cet article n’est pas le sujet, je me suis un jour retrouvé après une keynote de la conférence MixIT à me lancer dans une association pour les enfants. 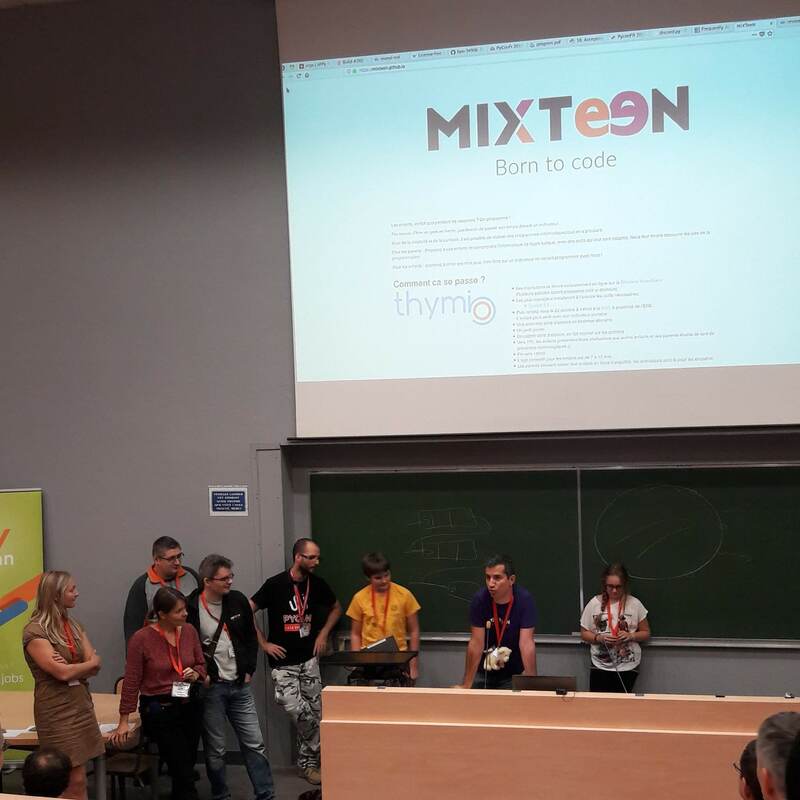 MixTeen est née de cette passion pour tout cet univers numérique (en français, digital concerne l’usage des doigts ;)) Nous sommes donc une petite équipe qui essayons d’organiser des ateliers de découverte. 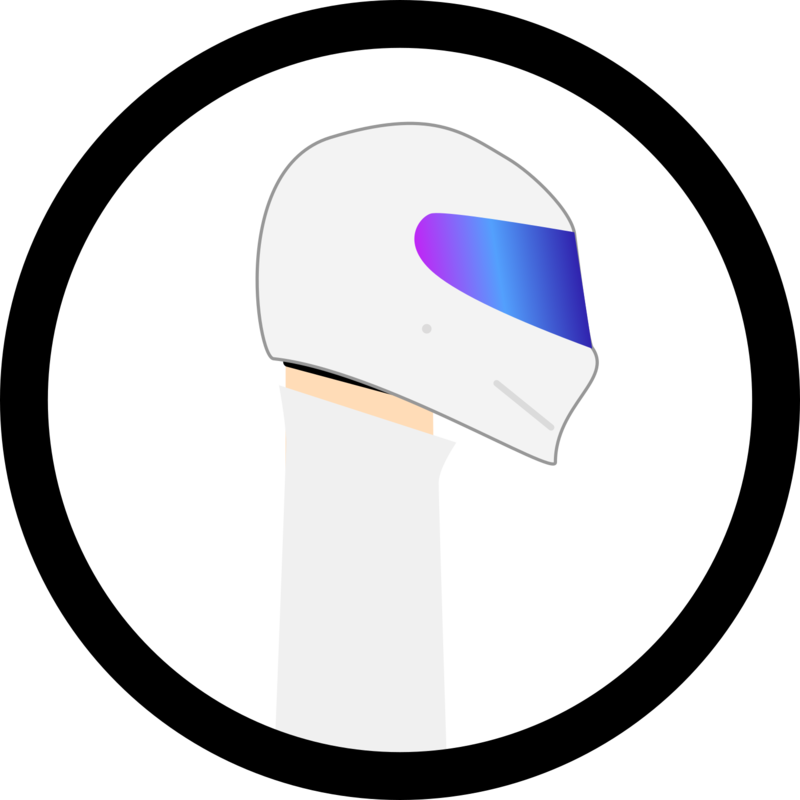 Les premiers pas se sont fait en utilisant Scratch, puis au fur et à mesure, tout ce que nous nous sentions d’utiliser. Rapidement, l’envie de lier cette découverte du code au monde physique s’est faite sentir. Comme j’ai pris goût au monde des makers, comme quelques petits bricolages par ici ou par là c’est avec joie que j’ai vu apparaître la carte micro:bit Très vite, cette carte ou de celles de chez Adafruit sont devenues des invitées permanentes de nos ateliers. En parallèle, certains enfants que nous rencontrons reviennent, grandissent et souhaitent aller plus loin avec Python. Le souci est alors d’avoir des outils suffisamment simples à installer et à utiliser, si possible sans connexion à Internet. L’apparition de Mu semble répondre à tous ces critères et on lui fait une place dorénavant. La gestion des cartes micro:bit est très sympa et la découverte de python me semble plus claire avec Mu. Les pythonistas de la PyconFR ont d’ailleurs bien aimé Mu. Cette fois là, en plus des enfants, nous nous sommes retrouver à initier des parents et c’était un très bon moment. Python on Hardware Vlog, from Adafruit. If you’re a mutineering mutant into playful hacking of embedded hardware with CircuitPython or MicroPython then check out the new video newsletter from Adafruit. It’s a quick summary of all that’s been happening in the world of embedded Python. Fun facts revealed in the show include such nuggets as the number of pages of projects, tutorials and how-tos about CircuitPython on the Adafruit website as well as the number of drivers for different devices compatible with CircuitPython. The numbers quoted show the growing momentum behind Python on embedded devices. This is good news! It was also great to see two Mu contributors (Radomir and Josh) have their work featured. Radomir’s inventive hardware hacking is a thing of wonder, while Josh’s work on the EduBlocks project is, quite simply, inspiring stuff (especially when you consider he’s only 14 years old!). 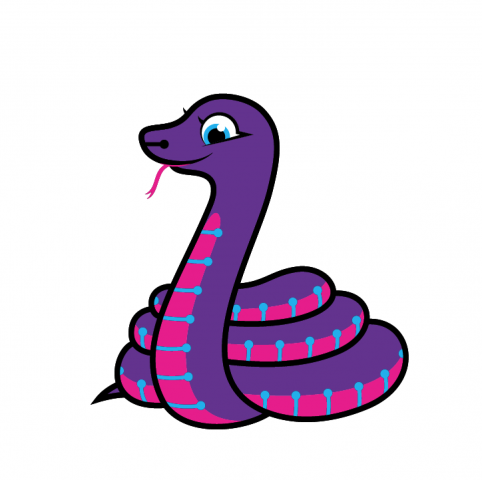 Finally, Limor, Phil and the wider CircuitPython team at Adafruit deserve kudos and all sorts of accolades for their amazing work building such a welcoming, dynamic and creative community around CircuitPython. As the project tag-line says, “Code + Community = CircuitPython”. Thank you for all the work you do! Fellow MU-tant (geddit?) 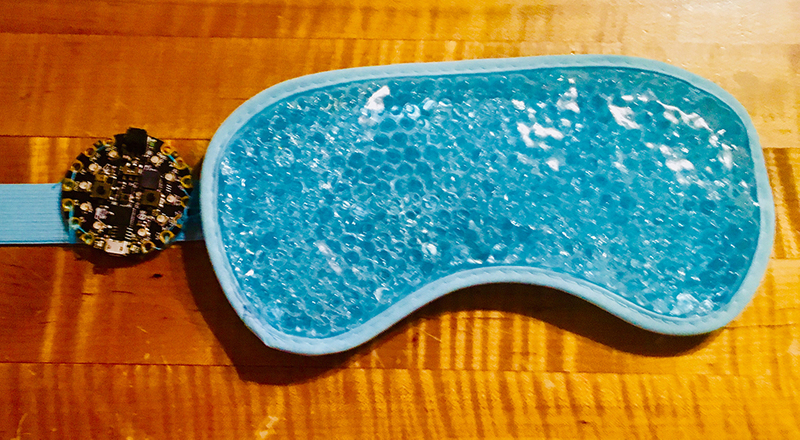 Les Pounder, has a stonking project for Halloween trick-or-treating, made with an Adafruit Circuit Playground Express board, CircuitPython and Mu. It’s too cool not to re-blog! The video below shows you all you need to know. Regular readers will know that Les’s projects are fun, playful, cheap to build and easy to assemble. Furthermore, not only has Les a gift for thinking up such stonking project ideas, but he’s a virtuoso mentor when it comes to explaining how to recreate such projects for yourself. Where am I going with this? If you are a teacher, Les’s blog is a GOLDMINE of ideas, resources and projects for use in your own classroom. #Create a function to play audio files. #Main Loop, press a button...make noise! 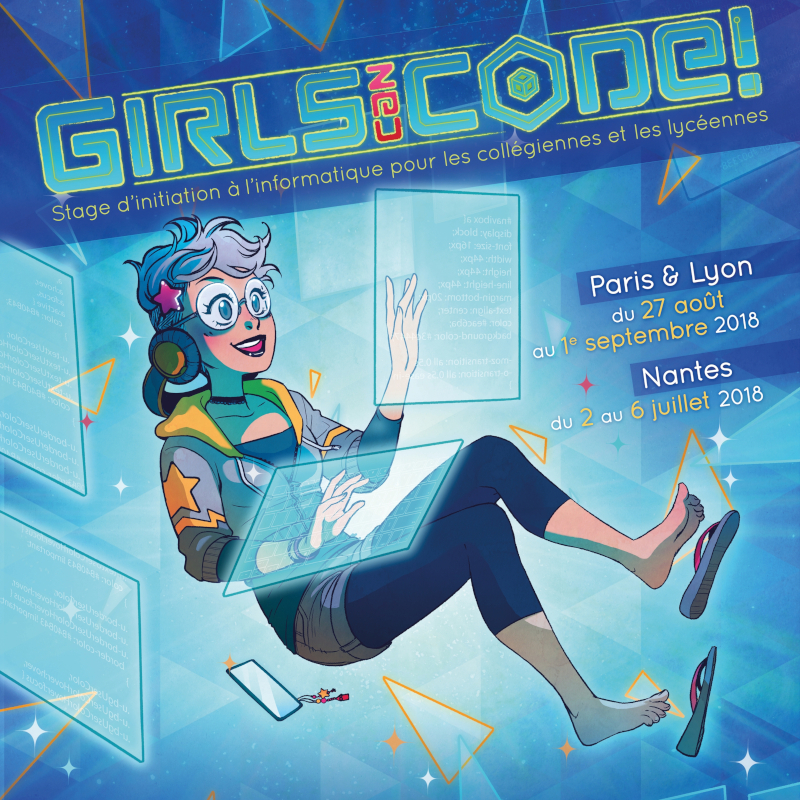 Check out Girls can Code!, programming workshops for girls based in France. Guess what? They use Mu! I went to Nicholas’ presentation of Micro:bits at PyParis 2017, and it struck me as an excellent learning tool for the Girls Can Code! summer camp we organize at Prologin. We decided to use Micro:bits with MicroPython for this edition, in the Paris and Lyon camps, so I naturally thought of using the Mu editor and its Micro:bit mode for that. I followed the development of Mu in the last couple of years and saw it slowly grow into a fully-fledged general purpose editor, so I suggested that we use it for the whole camp. 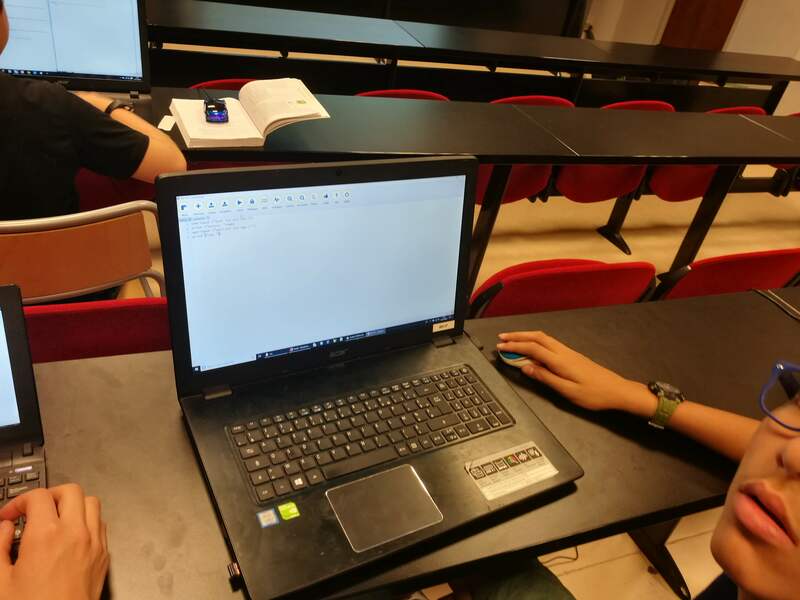 We were thrilled at how easy and useful it was as a learning tool for all our activities, ranging from Hello World to writing games with PyGame. We will definitely use it in the future, probably even when teaching to more experimented students. This is great to hear. Back in 2017 I was invited to give a keynote address at PyParis. It proved to be a fruitful trip: not only was the conference a wonderful experience and I made lots of new friends, but I was able to meet French computing educators like Antoine. This proved to be a key moment in the development of Mu as I was able to gather feedback from users for whom English is an additional language. Our discussions led to the following conclusion about non-English speaking learners: the biggest barrier to learning Python isn’t that its keywords are in English, but that the tools and resources for programming in Python are. Put simply, “je voudrais Mu en français”. Upon my return to the UK, I immediately investigated Python’s robust capabilities in internationalisation (also known as “i18n”) and this has led to Mu being available in ten human languages (including French) with more on the way. I hope you’ll be hearing more about Mu’s use in a French speaking context very soon. I also welcome non-English contributions to this blog too. Mu is definitely cosmopolitan in outlook and we want to encourage and help beginner programmers no matter their native tongue. 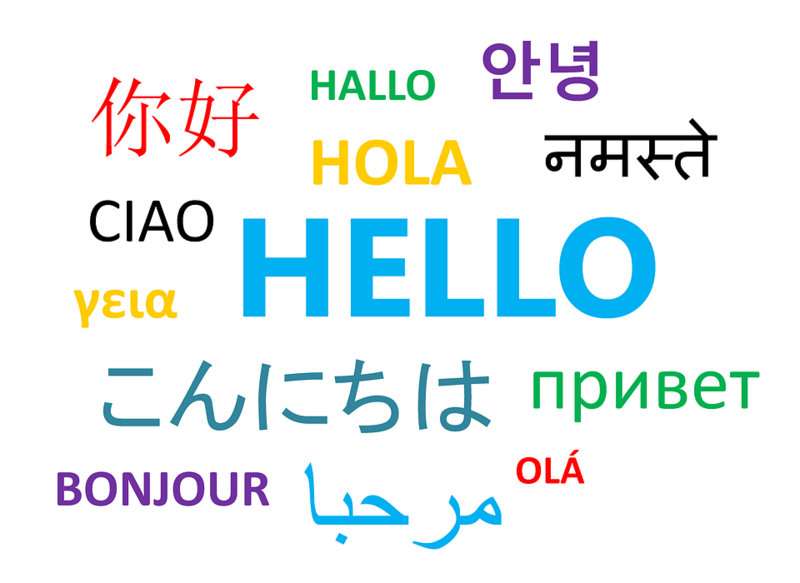 If you have a story to tell about how you use Mu in your own region and language, please don’t hesitate to get in touch. It’ll soon be PyWeek! Why not use Mu for a week of Pythonic game making fun? Your prize will be the fun of taking part and the respect of your peers. It was a huge amount of fun, the community involved is friendly and supportive and I’d like to encourage as many people to enter for the upcoming competition. 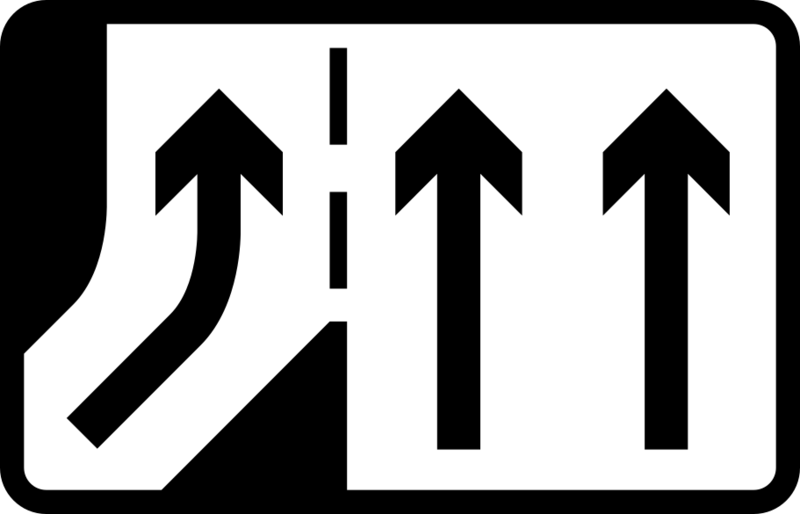 Entries must be developed in Python during the challenge, and must incorporate some theme decided at the start of the challenge. Anthony Briggs (who blogs at NeoLudic) got in touch via Twitter with a proof-of-concept for controlling PyGameZero games with a gamepad (such as the one you’ll use with your XBox or Playstation). The source code is nice and simple, although it relies an two patches which have not yet made it into a release of PyGameZero (so mark this as coming soon). One patch adds joystick support (i.e. what you do with the gamepad) and the other makes it easy to flip sprites. What I love about Les’s blogging is its consistency: there’s always something new and it’s always really imaginative and fun. Les is a great source of ideas for lessons, projects or learning activities for beginner programmers. For instance, on most Tuesdays he writes a “Tooling Tuesday” entry to his blog and many of these have a Python slant to them. Other related series of posts include “Micro:bit Monday” and “Friday Fun”. Any of these could form the basis of a cool project, set of lessons or after school code-club activity. So, here’s to Les, his blog and fantastically imaginative projects. What does software development look like? Here’s a short video / visualisation of the creation of Mu as told via the interactions, interventions and changes by developers to Mu’s own source code hosted on GitHub. The faces represent the developers. The multi-coloured blobs are the source code files that make up Mu. The lines between the source code blobs show how the files are organised together into directories. As time passes, developers can be seen to change, add and delete files as the project matures. I used the gource tool turn the commit history of Mu’s development on GitHub into a video. I added some Creative Commons licensed music and the results look and sound quite effective. What I really like is how the video reflects the wide variety of people and types of contributions made to the source code for Mu. Together, we’re continuing to build the best editor we possibly can for beginner programmers and those who support them. Ever wanted a pathalogically conflicted artifical intelligence for your own home? Why, of course you do! Adafruit’s CRICKIT board has you covered (along with instructions for how to program it via Mu). The Crickit (Creative Robotics and Interactive Construction Kit) is a an add-on for the Circuit Playground Express board. Cricket aims to make it easy to make friendly robots and thus make friends with robots (now there’s a sentiment we can all get behind). Essentially, Crickit complements and amplifies the CPX board by making it extraordinarily easy to interact with robotic “bits and bobs”. 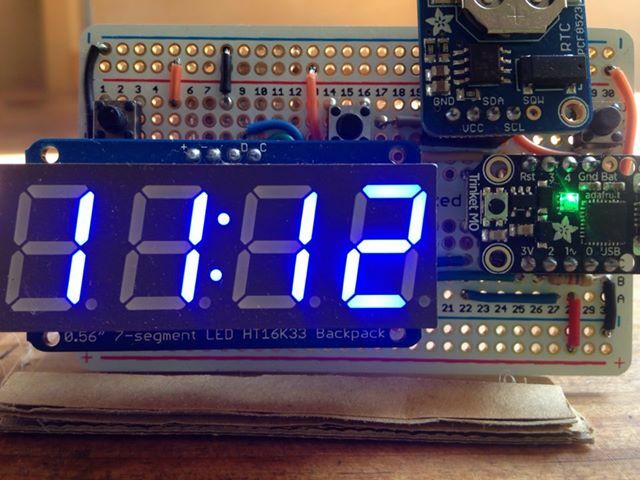 What I love about this project is how simple it is to make and program. Once complete, just press the glowing red button to hear audio clips of HAL. The source code is less than 50 lines of Python and, perhaps most importantly, you have a chance to replace the recordings so your HAL is no longer an uncooperative controller of on-board systems, but perhaps a friendly computer in the spirit of Cricket. What’s more, this project is relatively easy to modify to other concepts such as responsive cuddly toys or the world’s most friendly door bell (remember those doors from The Hitchhiker’s Guide to the Galaxy?). 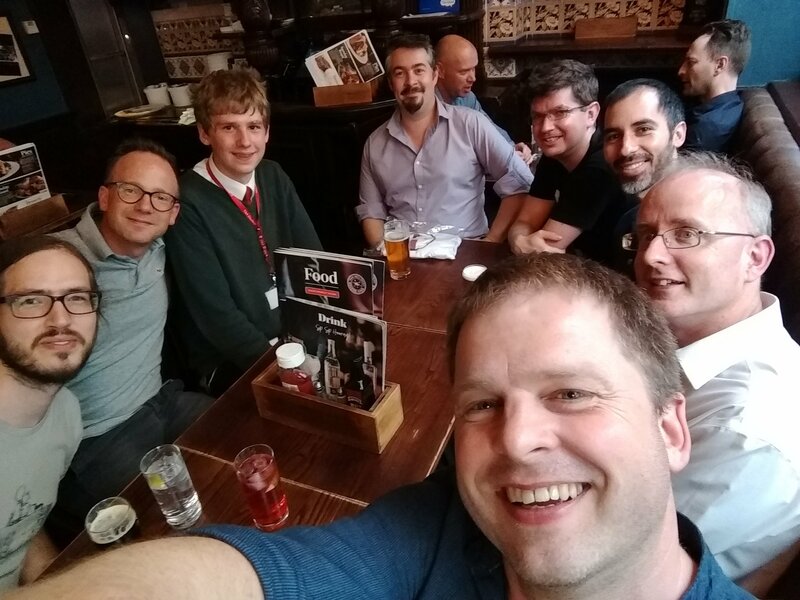 EuroPython (one of the world’s largest, most friendly and culturally diverse Python programming conferences) happened last week in Scotland. Sadly, for personal reasons, I was unable to attend. However, it was great to hear via social media that Mu was used in the opening conference keynote by Pythonista-extraordinaire David Beazley. Not only is it wonderful to see Mu used by someone so well respected in the Python community at such an auspicious occasion, but David’s use of Mu is a wonderful example of Mu’s use as a pedagogical tool. Remember, Mu is not only for learners, but is also for those who support them (i.e. teachers). What do I mean by pedagogical tool? The stereotypical example is a blackboard upon which the teacher chalks explanations, examples and exercises for their students. Teaching involves a lot of performative explanation – showing, telling and describing things as you go along; traditionally with the aid of a blackboard. This is a very effective pedagogical technique since students can interrupt and ask questions as the lesson unfolds. David used Mu as a sort of interactive coding blackboard in his keynote introducing the Thredo project. He even encouraged listeners in the auditorium to interrupt as he live-coded his Python examples. There are some who seem to think that one should start off using a fancy IDE such as PyCharm, VSCode, Jupyter Lab or something along those lines and start piling on a whole bunch of complex tooling. I frankly disagree with a lot of that. A simple editor is exactly what’s useful in teaching because it cuts out a lot of unnecessary distractions. From a more practical point of view, I choose to use Mu for my talk precisely because it was extremely simple. I do a lot of live-coding in talks and for that, I usually try to keep the environment minimal. […] Part of the appeal of Mu is that I could code and use the REPL without cluttering the screen with any other unnecessary cruft. For example, I could use it without having to switch between terminal windows and I could show code and its output at the same time in a fairly easy way. This sort of feedback makes me incredibly happy. David obviously “gets it” and I hope his example points the way for others to exploit the potential of Mu as a pedagogical tool. David also gave some helpful suggestions which I hope we’ll address in the next release. Finally, the exposure of Mu via EuroPython had a fun knock on effect: someone submitted the Mu website to Hacker News (one of the world’s most popular news aggregation websites for programmers). By mid-afternoon Mu was voted the top story and I had lots of fun answering people’s questions and reading their comments relating to Mu. Have you ever wanted to write a game? It turns out that Mu and PyGame Zero make this really easy for beginner programmers. Read on to learn how the author used both to create a goofy game for the wonderful PyWeek event. As the name suggests, all entries should be written in Python and incorporate a theme announced at the start of the challenge. PyWeek happens a couple of times a year and in April it was organised by my buddy Dan Pope (aka lordmauve). Dan has many claims to Pythonic-fame, but the one I’m going to focus on today is that he’s the creator and maintainer of a wonderful library called PyGame Zero. As the name suggests, PyGame Zero is based upon another wonderful library called PyGame (maintained by another equally talented buddy, René Dudfield). PyGame makes it very easy to create graphical games in Python. 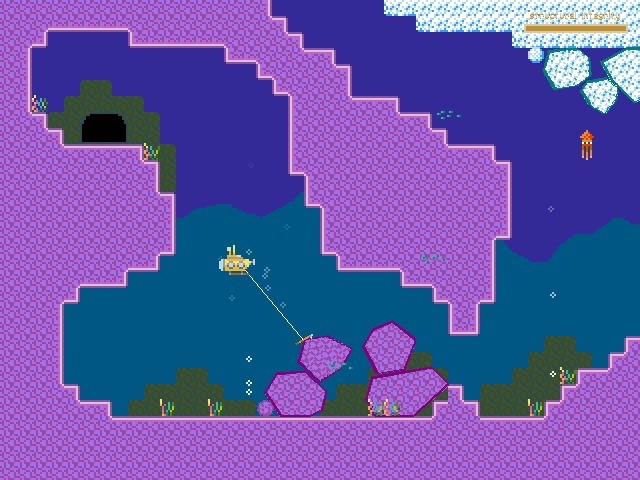 PyGame is highly portable which means that games made with PyGame will run on plenty of platforms. PyGame Zero is a beginner-friendly wrapper around PyGame. 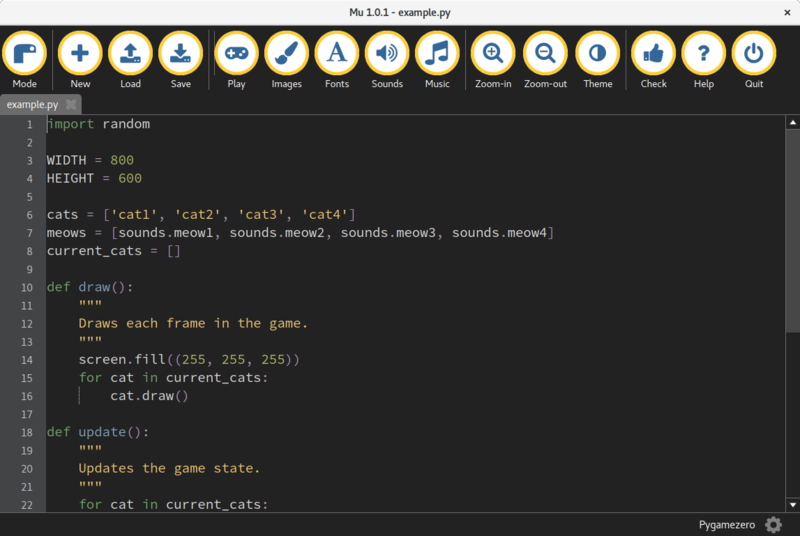 Dan created PyGame Zero after working with a group of teachers at PyCon UK’s education track. Since he’s a gifted and experienced game developer he was able to create a simple graphical game in about an hour. As he did so, he explained to the watching teachers exactly what it was he was doing. 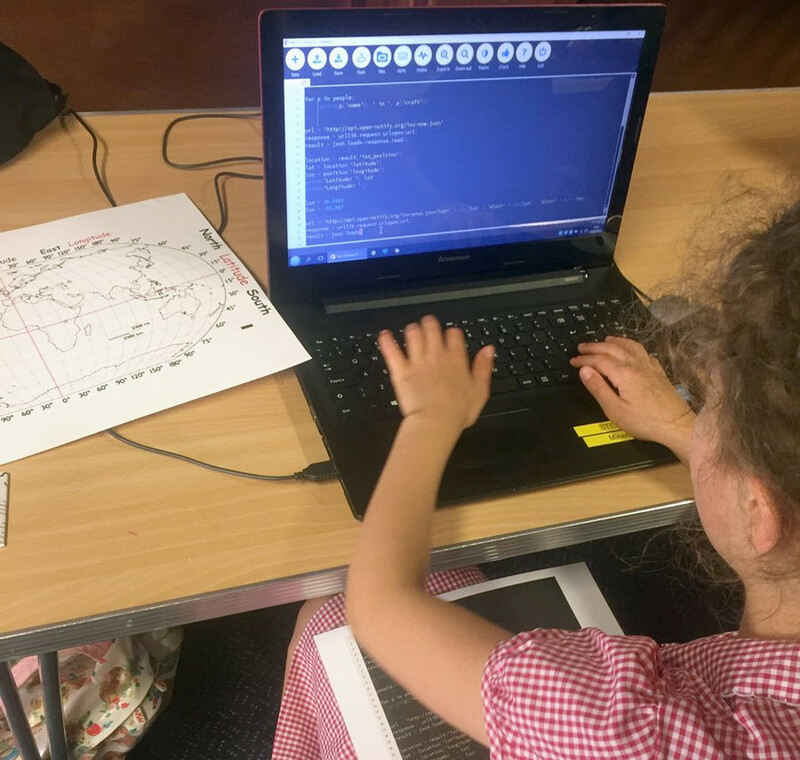 However, the feedback from the teachers was clear (paraphrased), “While PyGame might be easy for you (Dan), the kids we teach would find it hard to put together 10 lines of Python, let alone the 500 line you just created; we need a way that makes it easy to create something cool with very little code”. And so, the seeds for PyGame Zero were sown. Dan has created a simple and easy-to-understand wrapper that enables learners to make something graphical in only a handful of lines of code. If you’re interested in learning more about PyGame Zero (including a really great tutorial) go check out the beautifully written project documentation. Since Mu has a PyGame Zero mode, I thought I’d enter the most recent PyWeek and try to create my first ever game using just Mu and PyGame Zero. The theme was “two worlds” and after an ideas generation session (with input from my three kids) the concept for a game, called Paperchase, was born. During PyWeek, participants are encouraged to submit diary entries to plot their progress and so others can see how they’re getting on. This was a wonderful experience because participants leave supportive comments on each other’s diary entries and even give user-created “awards” (for instance, I gave one game “Ent of the Year” since the game involved becoming the spirit of a tree). You can read my diary entries here and all the participant’s diary entries are here. At the end of the week of coding, participants judge each others’ entries and a winner is declared for both individual and team entries. I’m pleased to say I placed a respectable 8th out of 23. Most importantly for Mu, I was able to try out writing an actual real-life game with it. The experience was remarkably smooth and it was fun to type some code and click the “play” button to immediately see the change take effect. Such a quick turnaround in a write-play-check-change cycle makes coding games lots of fun. I also quickly appreciated the ability to just copy and paste the different sorts of game asset into the right locations thanks to Mu’s shortcuts to the file system. I’d highly recommend everyone take part in a PyWeek – it’s a fun and supportive community who are friendly to newbies (such as myself). If you do take part, please consider using Mu and PyGame Zero! How did the game turn out? Here’s a video of me and my thirteen year-old son play-testing the game. The source code can be found here.